We offer the Web's largest selection of tractor attachments for sale. Use this page to browse our tractor attachment categories, and you can order online. Our tractor attachments are used for everything from mowers to grading, from farm implements to those for hobby farmers. You name it, we offer the major tractor attachment brands and look at the rest, and build the best. Clear brush from overgrown land in no time with a tractor rotary brush cutter. Use the PTO power of your tractor to clear off land and manicure your pasture. Free shipping! Click to browse our top rated tractor box scrapers. We manufacture the best US made quality box scrapers that receive high reviews from our customers. Buy your top quality box blade online today! Break ground with our industry leading rotary tillers that out perform the competition. We offer the highest quality rear tine tillers for your garden and landscaping needs. Pull weeds from your garden in a single pass of the tractor. Our American Made cultivators will have your garden looking and performing its best. We carry top brands of tractor pallet forks for purchase online. Take advantage of free shipping on our top of the line pallet forks for any size tractor. Make quick work of your leaf mess every fall with a leaf vacuum or blower from Everything Attachments. We only offer the highest rated leaf clean up equipment. Useful for food plots or gardens, tractor disc harrows break up ground to ease planting. Read the reviews on our equipment and get the best value on a tractor disc harrow. Convert your old pin on loader to a universal skid steer quick attach to save time and make your tractor more versatile. We have the best reviewed post hole diggers for sale. Our top rated post hole diggers are great for digging holes from as small as 4 inches to as large as 18 inches with the PTO power of your tractor. Order your post hole digger online and take advantage of our huge free shipping zone. We are the top seller and manufacturer of garden bedders. Our top reviewed garden bedders will mark rows and build hills with a V top in a single pass to form the perfect raised bed. Free shipping on scrape blades from Everything Attachments. Clear parking lots or driveways of snow, or clear ditches with ease. Convert your tractor to a trailer moving machine. Available for standard or gooseneck trailers, our top of the line trailer hitches will get the job done. Find top rated 3 point attachments for any size tractor. 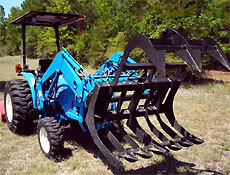 We carry a full line of compact tractor 3 point attachments and full size tractor 3 point attachments. Hay bale spears and bale unrollers all in one place. We offer free shipping within 1,000 miles of Newton NC on all hay equipment. Find the top rated attachments for your front end loader. What would a tractor be without attachments? Every time a new attachment is added to your arsenal, you open up Pandora's box of new projects you can take on. Whether you have a wide variety of attachments already or you feel content with just a loader, why not explore the possibilities of owning one or two more? Often times, we know what we want done, but we have no idea what attachment is right for the project. So we try to make it happen with what we have, but come up short or worse, damage our tractor! Like this member whose grapple broke when he picked up a tree stump that was too heavy, it's important to know the limits of your tractor and attachments. Read more about his experience: click here. We are excited for the possibilities of 2012 and hope you are too. So let's gear up and start it off right! This month, you'll find our usual highlights including the latest hot thread topics, tractor life products to enhance your country lifestyle, our new member of the month, and more! Below, click the photo links to learn about new attachments as well as gain further insight on how to operate your current weaponry. Learning about attachments and their proper usages will help you as you're problem-solving tasks on your property. You may even find one or two new attachments you can put into action on your farm or homestead!